The family of a talented young musician are continuing their fight for mental health awareness after his death. Described by loved ones as a ‘wonderful, kind, thoughtful and charismatic’ person, an inquest heard Thomas Salway took his own life by hanging aged just 24. A hugely popular individual, one of his passions had been working with Delta 7, the Eastbourne band for people with learning disabilities. 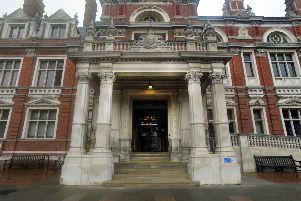 The inquest at Eastbourne Town Hall on Thursday (May 3) heard a statement from his mother, Linda Salway. She said, “He was a wonderful, kind, thoughtful and charismatic person who cared deeply for others. “He was a very intelligent boy. He was a talented musician and composer. He lived to spend time with family and friends. The court heard Mr Salway had been on strong painkillers for serious abdominal pain, which made him ‘lethargic’ and ‘low’. But he had stopped taking them a week before his death. Mrs Salway said in a diary her son talked about feeling isolated and distanced from others. She said, “He didn’t talk to any of us about these feelings. Mr Salway’s GP said he experienced auditory hallucinations as well as fits of anger and low moods which would last for weeks at a time. He had been in touch with mental health services, which launched an investigation after his death. The inquest heard how Thomas’ body was found by his girlfriend, Sophie Green, at their Seaford home on August 21. A statement from Miss Green said, “He was very charming, always seemed to know the right things to say. He cared for people, looked after me very well and his family. She said he would speak about the 27 Club, a number of famous musicians – including Jimi Hendrix, Kurt Cobain, and Amy Winehouse – who died aged 27. Her statement also said Mr Salway had a dark sense of humour and talked about suicide during their relationship. But she said, “I’m so confused about what happened. There was no indication he was going to do what he did. He texted a friend about meeting up the next day. Coroner Alan Craze agreed with what Miss Green had said. He concluded Mr Salway died by taking his own life. Speaking after the inquest, his family said they would continue to fight to raise awareness for men’s mental health issues. A crowdfunding page set up by his brother Nik Salway has raised £3,870 for Delta 7. You can still donate here.